This is my first post of “How I Got the Shot” series where I’ll be sharing my experience on different shootings I had the opportunity to work on. Since I’m by no means an Automotive Photographer, and rolling (and panning) shots are not my expertise, I can only assure I will try my best to cover all that is necessary for a successful first time shooter. 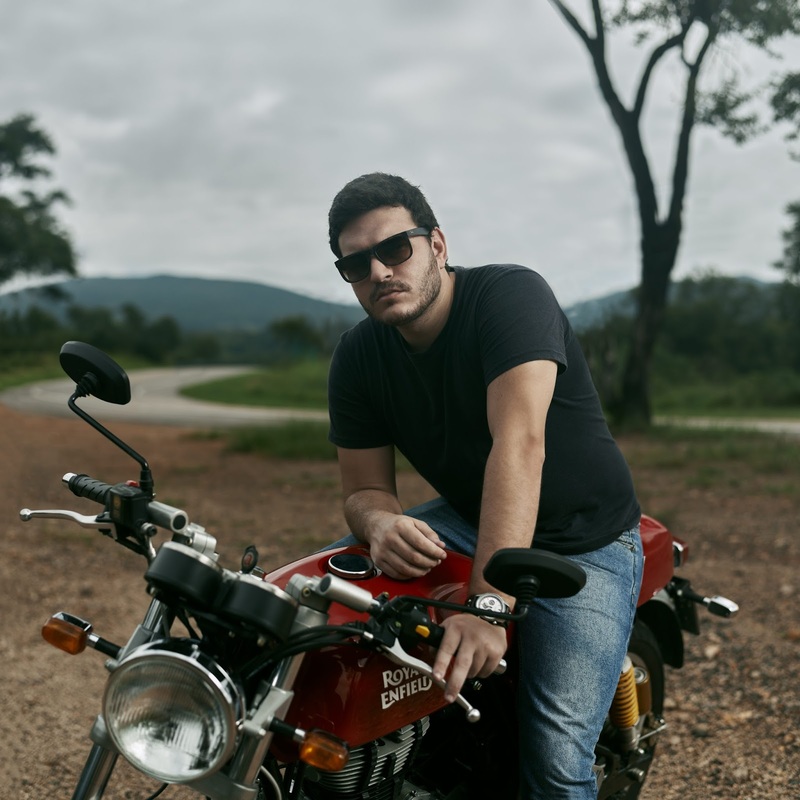 I added them to the photoshoot because it would work together perfectly for showcasing the Royal Enfield red Continental GT motorcycle, so I decided trying it out. Before the walkthrough of the complete photoshoot, I decided to make an overview of what’s to consider when photographing a rolling shot. I hope this content can be helpful for those who don’t know where to start and need some tips and tricks. There are basically 3 kinds of techniques when it comes to action automotive photography: rig, handheld and panning. All of them have their particularities I list bellow. Rig shot is when the camera is somehow attached to the subject; this kind of technique is used most often at car photography because it does have more space for the camera structure to be mounted securely on. Usually images taken with rigs have more movement on the background, although the speed of the car is slow (5mph average). Since both camera and car are simultaneously fixed together, exposure can be longer, hence creating a sense of speed by its length and not by the effective speed of the car. Rigs shots can be considered the most safe overal. Handheld shooting in automotive photography is when the Photographer is in another vehicle keeping the same pace of the subject. The Photographer can be on the back of the car, sunroof and the most common: on the oposite car window. There is a high chance you have already seen some behind the scenes of handheld automotive shots because is more affordable then renting or investing in a rig system. Despite being cheaper, it is more hard-working kind of photoshoot with safety precautions to be aware of — because there are two vehicles in a relative fast speed (abou 40mph); communication, skilled team and a more intent Photographer are also key for a successful handheld shooting. Panning is the most common technique for a motion blur effect on the background; it is exhaustively used in a variety of types of photography because of its easy of use. When learning the basics of photography, panning is a good technique for understanding how shutter speed (and the “exposure triangle”) works, producing visually impactful images. With no specialized equipment required, panning can be achieved tracking the camera along a moving subject at a slight slow shutter speed (enough to prevent camera shake). It can frustrating when you are not used to it, but with patience and practice is really feasible getting a good panning shot. Either technique you choose, location scout is fundamental for a safer automotive photography. It is very important schedule a time and a day with low traffic if your plan shooting in the city so you and your team don’t take any unecessary risks. If you wish to shoot on a public road, also go for a low traffic one (where no trucks are allowed if possible) with hard shoulders you can safetly test before the real shooting; but remember properly flagging the shoulder area you will be using for obvious safety reasons. Be cautious, secure your camera with a strap and make sure to have clear communication with both drivers; don’t be longer than you need, specially if it is a handheld kind of shot. Be aware of your country legislation, speed limits, traffic laws, lane discipline, etc. Again: safety is paramount, never compromise the safety of anyone around you. You can photograph action motion shots with pretty much all kinds of interchangeable camera system, from entry level mirrorless and DSLRs to professional grade camera and lenses. What matters most is having an understand of how each focal length behaves and how camera exposure works. For rig and handheld shots is recommended a ultra to wide-angle lenses with VR/IS (Vibration Reduction/Image Stabilization); panning can be done with any focal length you have avaiable just try keeping steady for an accurate subject sharpness — remember: the longer the lenses, more unstable it gets). Circular polarizer filters will help preventing reflections frequently seen in automotive photography. Neutral density filters can help in bright light conditions and will allow to use even slower shutter speeds. And a strap for protect your camera from falling in the worst case scenario. Slower shutter speeds (you can start at 1/60s with a 24mm lens) generally will help getting the motion blur in the background, but it is all relative with the pace you and your subject is moving. Higher f-stops will help getting your subject in focus, a good rule of thumb is start around f/11 and adjust accordingly; if your using an ultra wide lens, you can even get sharper images at f/5.6. It is recommended using Continuous (or Burst) and AF-C (or AI-Servo) for tracking focus on the subject and also getting more frames at once. Since in Continuous and AF-C, a good big and fast memory card is more suitable. It’s more likely to get a flattering image in the sunrise or sunset. Backlight situations can ramp up production value of the shoot and make it more dramatic, but it does need more attention in post-production because cameras limitations in the exposure variation when capturing light and dark areas — shooting RAW is fundamental in these cases. For this partnership with Royal Enfield our idea was to showcase the lifestyle of a contemporary motorcyclist on the road. 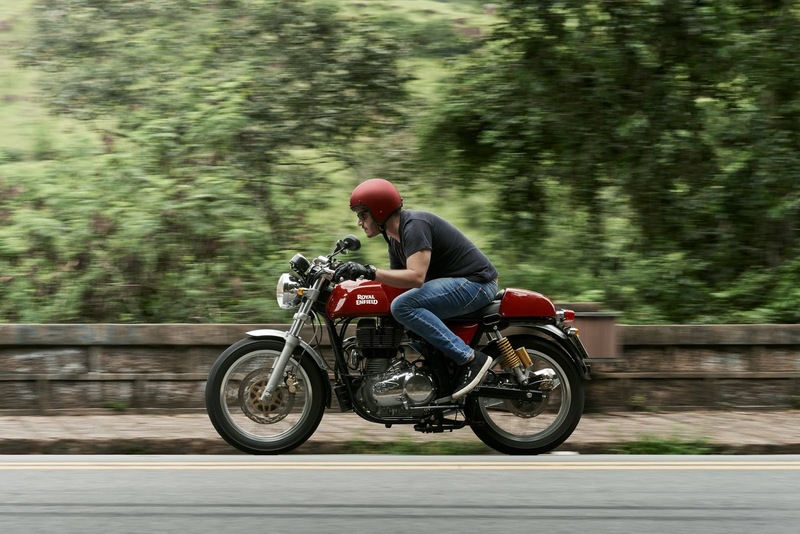 The Continental GT stands out as a cultural phenomenon café racer style in the Royal Enfield line up models, featuring a motorcycle with minimalist design in a lightweight bodywork and control layout. In the early 60s enthusiasts that couldnt’ afford a car would custom build bikes for quick rides — soon to become a subculture status symbol, representing speed, status and rebellion. 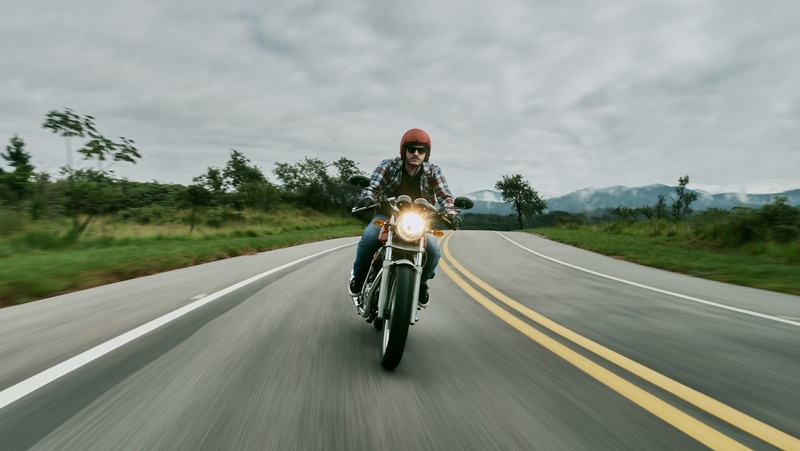 Nowadays the café racer scene is more neutral than the niche lifestyle represented in its beginning, and the photoshoot emphasis a modern individual that feels confident riding a motorcycle based on the design first introduced in 1965. Some café racers purists insists on custom machines and personalization, but motorcycle companies are now offering retro inspired models to market their bikes due the high demand of its aesthetics. 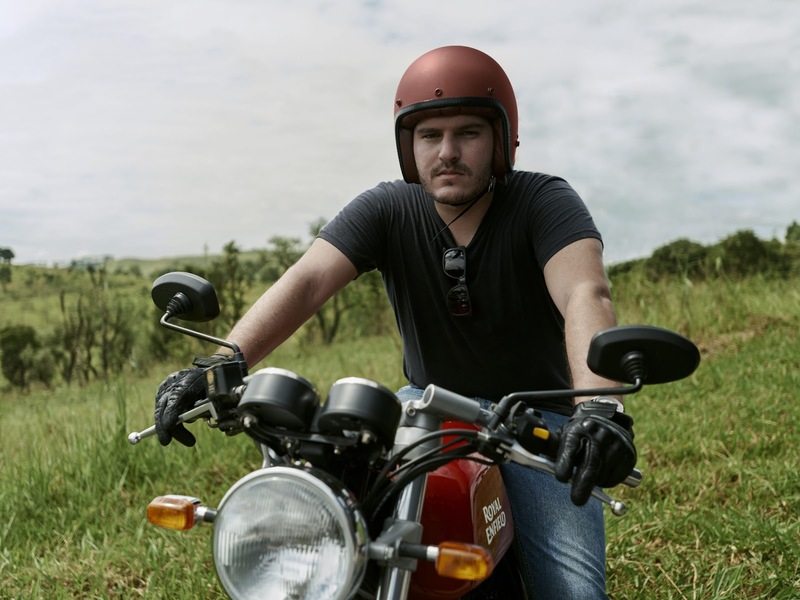 On the other hand, recent adopters praise the democratic aspect of expressing their indivuality through a mass produced standard café racer motorcycle. At any photoshoot, planning and pre-production plays a big role in the progress of a successful work. 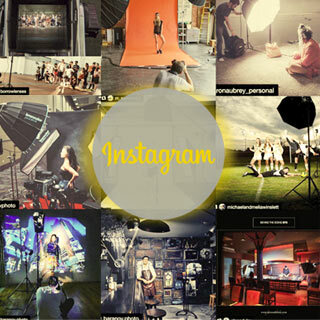 It is paramount covering important topics such as styling, location, time of day and concept. 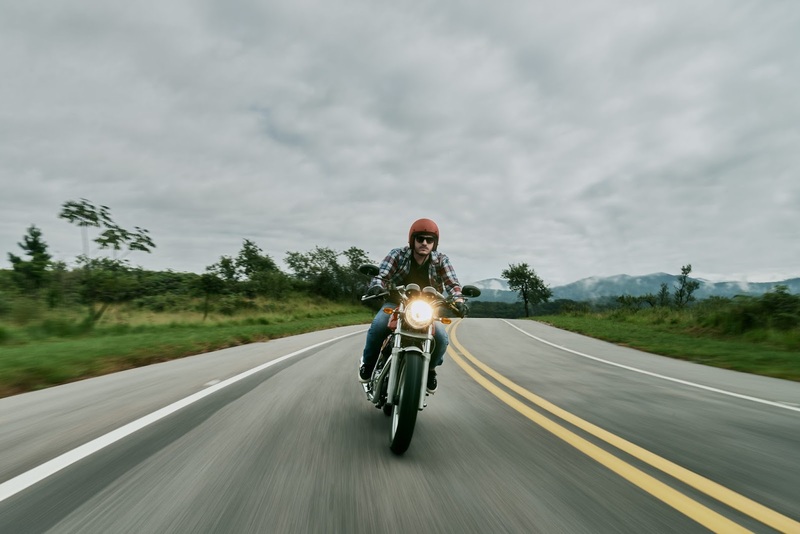 After the first details of the partnership with Royal Enfield Brasil, me and the assistant and videomaker Lucas Hashimoto created a temporary chat group to exchange information about the project. 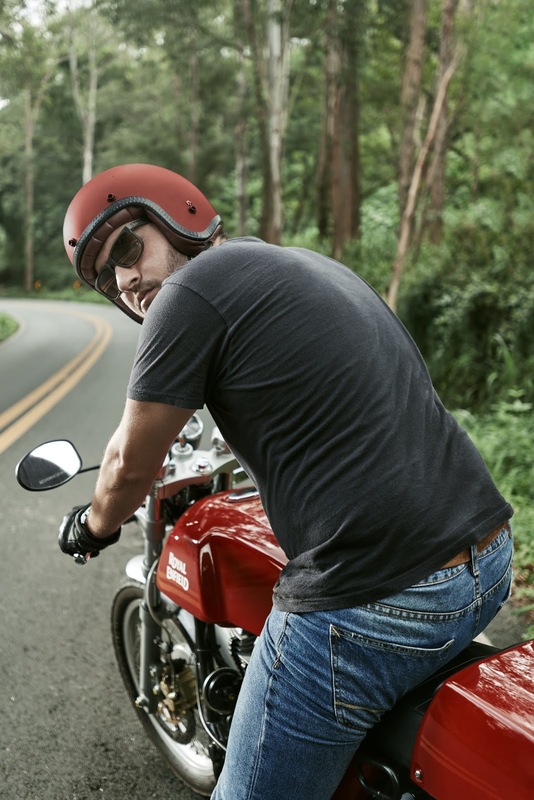 The classic red Continental GT was choosen to be the leading figure along the driver Gabriel Bicudo. The model was an experience driver, and we talked about going for a low profile and neutral stylishing, something tangible for new adopters and not distant for the former café racer. Covering a storyline of an individual having a good time on the road and all things between would help covering a variety of shots, and not only the usual motion photography of automotive sessions. 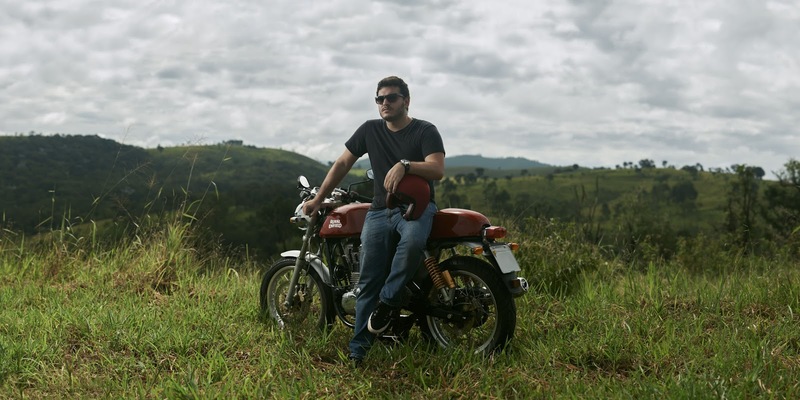 Gabriel Bicudo, as mentioned before, is an experience driver and helped us choosing Romeiro’s road located in Cabreúva, municipality 56 miles away from São Paulo in Brazil. Romeiro’s road is known by the use of cycling training because of the low traffic and the ban on trucks, perfect for the handheld pan shot on the car and the panning shot. 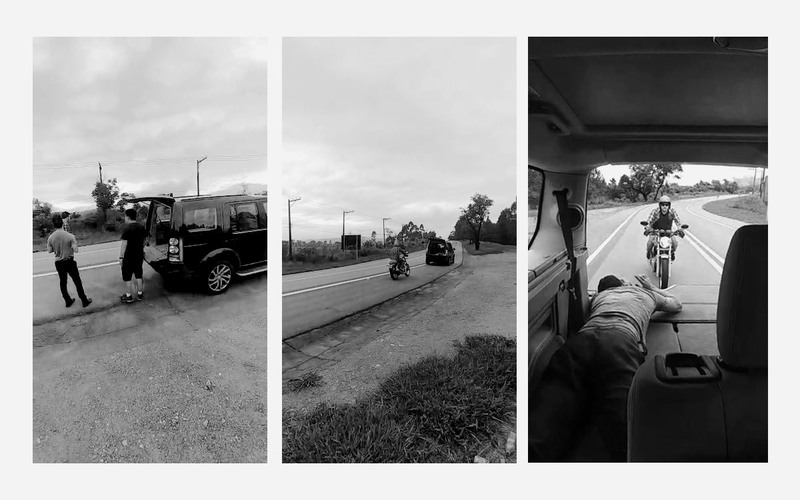 We teamed up with another experience driver that would help us driving the support car, and we tested before the actual shoot how we would communicate to prevent accidents. More often than not, things don’t go as we plan. That’s the irony of planning: you plan for something not go wrong, but something not planned happen. In the planning stage I have envisioned using a natural summer backlight sunrise vibe for the motion/panning shots; and balancing the sun exposure using off camera flash (Einstein E640/47” Foldable Paul C. Buff Octabox) for the stationary portraits. 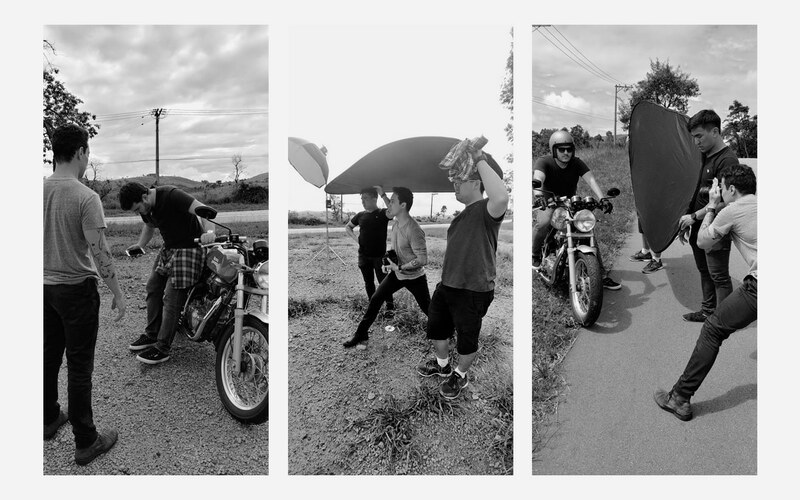 Unfortunately, one day before started raining… I wouldn’t able to gather the team together and redo the logistics of it in the near future, so we decided not to revoke the photoshoot. It didn’t rain in the following day, but the we got a pretty overcast sunrise for about 3 hours, and sundely the hard midday light was all over the place — a challenge situation. Ultra wide-angle lenses can make a dramatic action portrait, but I went with a slightly longer 24-120mm f/4G lenses because of its VR (Vibration Reduction) capabilities. 24-120mm f/4 is a very versatile lens and I also used the standard 50mm 1.8G for portraits and composing panoramas. The ultra wide 17-35 was specifically used on an action establishing shot (17mm), and a specific half body portrait (35mm) I wanted to give the sense of placement in the shot. Nikon D800. Nikon AF-S NIKKOR 24-120mm f/4G ED VR @ 24mm. 1/30s. f/16. ISO 100. The main shot was this rolling shot. I planned getting the sunrise backlight with no lucky, the morning stayed overcast for a long period and I worked with what I had because we were on limited on time schedule. I even suggested the team to wait a little longer to see how the weather would change, but in the end I accepted the fact it was going to be a partly dark cloudy morning looking image. After a few attempts in the road shoulders for getting shutter speed and overall exposure on point, we went for a few more attempts in the main road. I used the Nikon 24-120mm at 24mm with VR enable, and a shutter speed of 1/30s — my limit for getting a sharper image in these conditions. The car was about 30 to 38mph. One good thing to remember is having a good clear communication with both drivers, and previously tell them to keep the same pace. Nikon D800. Nikon AF-S NIKKOR 50mm f/1.8G. 1/250s. f/2.8. ISO 50. 3 Vertical shots stitched together. After the rolling shot we settled down for a classic shot portrait with a stoic pose on the side road, these kind of shot are good for complementing the story of a visual narrative. The above photograph is the result of 3 vertical shots with a 50mm lens, this technique is also referred by “Brenizer Method“. I used an off camera 640 Ws flash with an octabox angled down and feathered to the camera, this configuration gave me a constrasty image even in a overcast day, but without the hotspots caused when the flash is pointed directly to the subject. Nikon D800. Nikon AF-S NIKKOR 50mm f/1.8G. 1/250s. f/2.8. ISO 50. 6 Vertical shots stitched together. As we were moving throughout the morning, the sun begin to shine and we started switching a bit the look of the images. First we made a panorama above with a side key light using a 47 inch softbox octa and a Einstein E640 flash from Paul C. Buff. 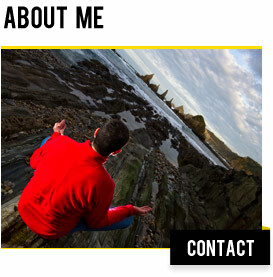 The shot was acted to be an in between contemplative moment in the image storytelling. Nikon D800. AF-S Zoom-NIKKOR 17-35mm f/2.8D IF-ED @ 35mm. 1/500s. f/2.8. ISO 50 . Second we got a natural shot with a light blocker on the subject right. A shot where the model have eye contact with the viewer and is preparing to keep moving on. Nikon D800. Nikon AF-S NIKKOR 24-120mm f/4G ED VR @ 85mm. 1/125s. f/16. ISO 400. The panning shot was (obviously) easier to get than the handheld on the moving back of the car just because the fact I stayed freeze to prevent camera shake and the model passed on the my parallel. It did took a few tries to get the perfect composition, the perfect exposure and a sharp image. I used the Nikon 24-120mm at 85mm with VR enable, and a shutter speed of 1/125s — relatively slow considering the longer focal lenght. The natural light was constant but the location we chose, there was a natural rock wall behind me blocking a lot of light, thats the reason I bumped up the ISO to 400. Nikon D800. AF-S Zoom-NIKKOR 17-35mm f/2.8D IF-ED @ 35mm. 1/250s. f/2.8. ISO 100. The half body potrait above intention was to have a visual understanding of a moment the driver has stopped, but is leaving his own way right after. With a lot of ambient light, I positioned the flash as key to balance the shadows on the face mimicking a bright day light passing through the trees. Nikon D800. AF-S Zoom-NIKKOR 17-35mm f/2.8D IF-ED @ 17mm. 1/500s. f/8. ISO 1600. We were almost done when we got to a spot full of trees with great natural light. 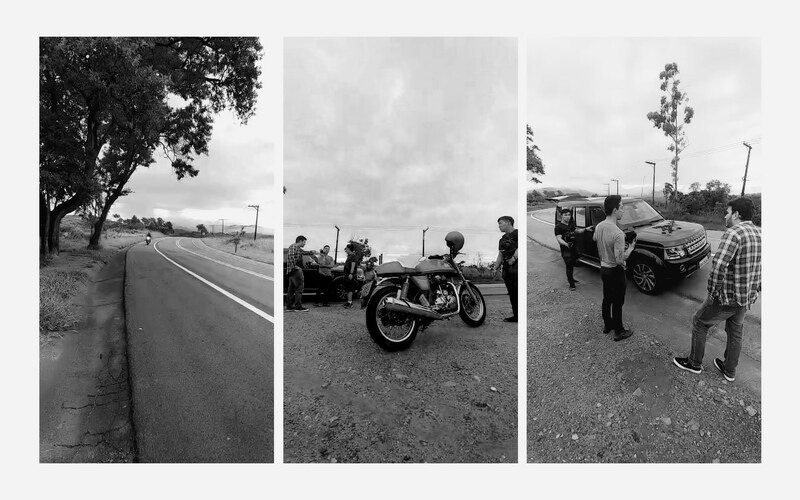 We decided to pull out and I took a few frames; I used the 17-35 f/29 at 17mm with a full-frame panorama aspect ratio of 3 : 1 to get the sense of immersiveness of a motorcycle passing by it. Location scout, planning, and hearing what the team has to add . Getting ready, test attempts, and the shooting time. Directing, shooting with flash, and shooting with natural light.